Koh Phuket with its clear waters and beautiful beaches with soft white sand and palm trees swaying in the wind draws visitors to Phuket. 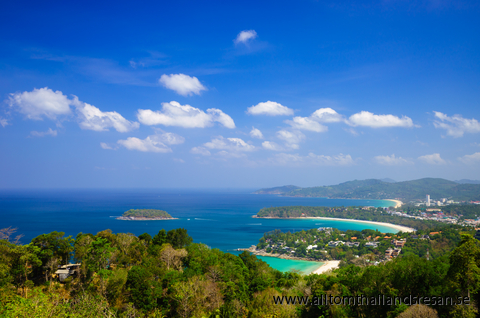 The name Phuket is derived from the Malaysian word Bukit which means mountain. It fits well as it is similar to a mountain that comes up from the water. Phuket is Thailand's largest island, it is about 550 square kilometers and about as big as a third of Sweden’s Gotland. The island measures approximately 50 km from north to south and faces the Andaman Sea on Thailand's southwest coast. You can reach the island by a bridge called Sarasin. Landscape on the island is different than what is available in more northern Thailand find the paddy fields, rubber plantations, pineapple plantations, cocoa and coconut plantations. Here they also harvests cashew nuts. It is fertile and everywhere Phuket is considered one of Thailand's wealthiest provinces. The first inhabitants of Phuket which was then called Thalang was Nomad fishermen and sea gypsies afterwards moved Thais, Malays, and Chinese to the island. Today the population lives mostly on tourism, but also the fishing is an important source of income for the inhabitants of the island. Additionally, Phuket is a center for the mining of tin. Although hotels and restaurants have transformed the island in total in the last 20 years, it is still incredibly beautiful here, the water is crystal clear and most of the hillsides are still green. Tourism on the island has led to the quality of the road network has improved considerably and that the range of activities to do is almost unlimited. The supply of housing facilities such as restaurants and hotels and resorts, there is something for every budget and taste. The climate on the island do not differ significantly from other parts of Thailand, the peak season falls on the dry and hot month which falls from November to March. In December is the peak period when all travelling to Phuket for celebration of Christmas and New Year, then it might be good to know about other options, might resort of Mae Phim located in Rayong province. The high season on Phuket invites you to swim and when the water on the island is quiet and pleasant. During the rainy season, which occurs from April to October, there are not so many tourists on the island, should add, however, that it does not rain every day, even if it is called the rainy season. In May and October you can experience the tropical rain showers every day, in the worst case for a whole week. At this time swimming is almost impossible at some beaches on the island because the currents are strong and the waves are very high. Today Phuket consists of 75% Buddhist, 22% Muslim and 3% Christian or have other believers religions. There are many lovely beaches on Phuket, the absolute best on the west coast. Most beaches have everything you can imagine in various water activities. The range of restaurants on the island are huge, there is everything between heaven and earth. One thing is certain, you do not need to be hungry when you are on holiday in Phuket. Phuket has a well developed nightlife and what you may not find here is probably not worth finding either. Probably you feel that the prices are low, but the truth is that the pricing here in Phuket is expensive compared to other places in Thailand. Phuket has its own airport and if you want to travel with domestic flights, you can book this from home. The flight time between Bangkok and Phuket takes approximately 1 hour and 10 minutes.